As we covered in a previous blog, it’s important to keep your packing list for your RV trip light and compact. One of the easiest ways you can save on weight and space is by planning out your meals. Instead of buying an abundance of canned foods and winging it, having a meal plan ensures that you are only bringing the essentials when it comes to your groceries. In addition, prioritizing cooking while you are on the road will save you money and is healthier for you in your family. The benefits of meal planning are clear. So how exactly do you make sure that you have a realistic, healthy, and delicious meal plan prepared before your trip? Write It Out: Make sure to keep organized with your meal plan. Print or write out a calendar of when you will be making everything so you can keep on top of prep. This also allows you to plan your meal according to what will be best for each day. 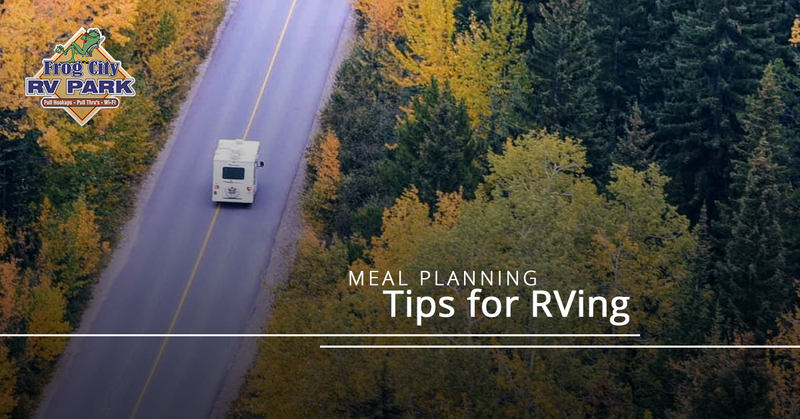 Rotate Meals: You can cut down on the amount of different spices and pantry staples you need to pack into your RV by repeating meals, particularly for longer trips. You don’t necessarily have to eat the same thing every day because that will get boring very quickly, but rotating your menu every week or every 10 days can help you get the most out of the ingredients you buy. For example, you could have Taco Tuesday every week. With time, you will use way more of the food you buy than you would have otherwise. Use Recipes With The Same Ingredients: You can seriously save on space by planning your meals to including corresponding ingredients. For example, planning on making both spaghetti and lasagna at different points during your trip allows you to use tomato sauce, ground beef, and parmesan cheese in both. Keep It Simple: Everything about RV living revolves around this philosophy. The simpler you make your meals, the easier your life will be. Think about meal prep in terms of the space you will have. You might have certain go-to recipes you always cook at home, but if they require you to cut up a bunch of veggies or use a lot of different ingredients, they probably aren’t practical for an RV. Choose recipes with only a few ingredients in them. Also consider how the meal is prepared. For example, a one-pot pasta meal is an easy meal for a camper. Prep First: Before you leave for your trip, you can do a lot to prepare to make cooking even easier. Try cutting up vegetables and raw meat and freezing them, and consider prepping any spice mixes or marinades beforehand. Taking a little time before your trip to prepare for meals will make it much easier to cook when you are on the road. Try a Slow Cooker: One of the easiest ways to cook is using a slow cooker, and this can be a lifesaver on an RV trip. When you have a day of exploring outside the camper, whether hiking or checking out the attractions around Frog City, you can throw a meal into the crockpot, and by the time you head home to eat, dinner is ready and waiting for you. Pro tip: use slow cooker liners to save on clean up time! Buy Smaller Containers: While buying in bulk might save you money, it really takes up a lot of room that you can’t afford in an RV. Smaller containers of ingredients you only need small amounts of, such as olive oil, can save you a ton of space. If you are looking for a place to stop in Louisiana on your big RV trip, consider Frog City RV Park as your best option. Reserve a spot today!